Socky Wocky sell cool, fun & motivational children’s socks. Our colourful socks help kids be the best they can be with funky & unique styles. Positive affirmations to remind kids how great they are! ​Positive socks creating positive children. Let's be honest, some days are tougher than others for our little bambino’s. A little motivation and encouragement work wonders! 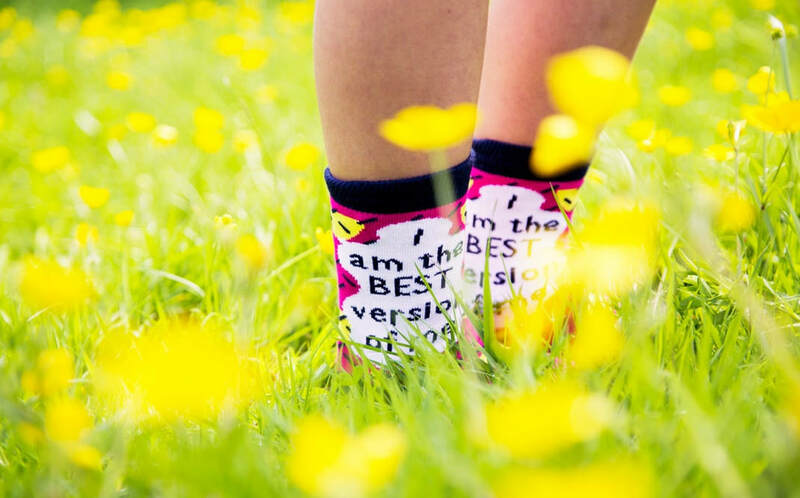 That's why we (Safin and Mummy) came up with the fantastic idea of funky, fun and colourful socks, emblazoned with unique, positive & motivational affirmations to remind our little treasures all day long exactly how great they are! 9 year old Safin is the creative genius at the forefront of Socky Wocky ... with just a little help from mummy. Safin is a regular boy, who’s not keen on home work, has a very messy room and if allowed, would eat way too many sweets! Safin came up with the amazing concept to design and manufacture cool children's socks using positive affirmations. Curious, I questioned why the use of affirmations? To which he simply replied, ‘I want to make everyone feel happy’. An hour later we were at the kitchen table designing socks and coming up with more fantastic affirmations. As a family we are massive fans of affirmations, which we all use regularly. We feel its important to appreciate how fortunate we are, as well as the importance of helping others. It always makes me smile when I hear Safin using affirmations, being his very own cheerleader. As adults we all love a pat on the back, to hear how great we are and children are exactly the same. As humans we can be our own worst enemy. We limit reaching our full potential due to lack of confidence. That’s why Safin wants to help empower young children to put a stop to self doubt and motivate others just like him to take control of their self belief. Of course, with lots of encouragement from us big people. Safin loves the idea of seeing all children happy. He wants everyone to believe that they are capable of doing anything they put their minds to and the importance of being the best version of you. Affirmations are an amazing way of bringing emotional support and positivity into our children's lives, when they feel a little low or just need some motivation. Affirmations are short sentences with the goal of entering the subconscious mind by repetition. Using carefully chosen words, they have the ability to motivate, encourage, inspire and energise when repeated, thereby having a positive influence on behaviour, habits and reactions. When positive affirmations are used over and over, a clear message is sent to a specific area in your brain, confirming that this phrase is important to you. When done regularly, the brain then takes notice and gets to work helping you to believe it yourself. That leads us back to the beginning, “Really cool, colourful and fun socks!” (Safin’s words exactly). Safin is the boss! He briefs the designers, putting forward all his ideas and visions (he is very particular when it comes to the colour combinations). He even designed his own logo; a cheeky drawing of himself! Most, if not all of the ideas are his. Mum just does all the admin, typing, washing his smelly socks and phone calls… oh, and whatever else Safin needs doing!